I love baked potatoes, so I decided to turn this favourite side dish into a soup. With its velvety texture, cheesy flavour and crusty baked potato garnish, you’re sure to agree that this combo of baked potato and soup is comfort food. 1. Preheat the oven to 450°F. Lightly spray a baking sheet with vegetable oil. 2. In a soup pot over medium-high heat, heat the oil. Add the garlic and onion and sauté for about 3 minutes, just until softened. 3. Peel 3 of the potatoes and dice (do not peel the remaining potato; reserve for the next step). Add to the saucepan along with the stock. Bring to a boil, then cover, reduce the heat to low and simmer until the potatoes are tender, about 20 minutes. 4. Cut the remaining potato (unpeeled) into 12 chunks. Place in a small saucepan of boiling water and cook for about 5 minutes, just until tender. Drain well and transfer to a bowl. Add olive oil, 2 Tbsp of the Parmesan, and the salt and pepper, and toss to coat well. Arrange in a single layer on the prepared baking sheet and roast in the preheated oven for 15 minutes, until lightly browned. Remove from the oven and mash gently with a fork. 5. Working in batches, transfer the soup to a food processor or blender and purée until smooth. Return the puréed soup to the saucepan. Stir in 3/4 cup (185 mL) of the cheddar and the remaining Parmesan. Simmer, stirring constantly, for about 2 minutes or until the cheese is completely melted. 6. 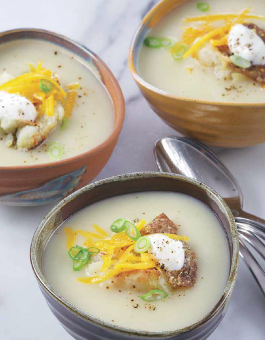 Ladle into soup bowls and garnish each with a spoonful of the roasted mashed potato, black pepper, green onions, sour cream and the remaining cheddar. Serve.